With planned workouts you can lay out your training plan for a specific event or race, or plan your workouts for an entire season. Scheduling your workouts will keep you on track by letting you see how well you are meeting your goals. Seeing your upcoming workouts is also a great way to hold yourself accountable on those days you're not feeling inspired. From the weekly calendar view, click the day number to add a planned workout. You can add a planned workout to any day from today forward. You can create a primary goal of time or distance, and optionally specify a speed. If a speed is provided, the equivalent distance/time is calculated. After you save the planned workout it appears in your calendar. The look is similar to a completed workout, but includes the flag, name, time and notes instead of data fields. On the monthly view you can also click a calendar day to create a planned workout. For additional details, you can click a planned workout, or flip over to the week view which provides slightly more info. Another place you'll see your upcoming workouts is on the Dashboard. If you've added a planned workout a new section will appear at the top of the dashboard showing the workouts for the next week. You can click the planned workout to see details, to add additional notes, or to edit the date, goal, etc. You may also notice a delete button. You should only delete a workout if it was mistakenly added to your plan, not to mark it as "missed". If you're going to miss the workout there is nothing you need to do - as soon as you move past the workout date it will be marked as "missed" unless an actual completed workout is performed that matches the plan. Read more about monitoring your training plan here. Certainly needed, thanks, however I don't see any totals that include the planned runs? I have to pull out my calculator to tally the week. for example, this week I have done 10 and 16k, and have entered 4 planned runs totalling another 54k, for a planned total of 80k. However the total for the week only shows 26. What am I missing? I have the same problem as mentioned above by Stephen Jackson. Mobi seems to total planned workouts for weeks where there are no "actual" workouts, but once you have a recorded workout, it no longer includes planned workouts in the weekly projection/total. Also, I only see these totals on the "month" view, and don't see totals for planned workouts on the "weekly" view. +3 for recurring workout scheduling. Also, need way to save workouts to be recycled for future races. Also, need ability to plan out a training season. Need ability to automatically ramp up training load in volume or distance. It's tedious to do this one by one and not have them saved for next year. I have fitplan but if mobi doesn't talk to my local copy, it really limits my usage of the .mobi version. Thanks for adding this much needed feature. +1 for saved workouts to be assigned to various dates as desired. Also, I'd like to see this feature on the Windows PC Sport Tracks application. 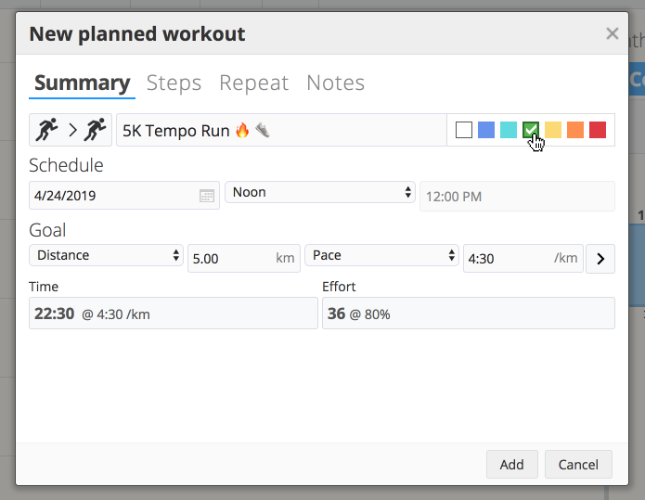 The "Add planned workout" feature now includes a repeating option that allows you to create multiple planned workouts at once. The options are quite flexible including the ability to progressively increase the time/distance goal. As Paul just wrote, there's no way to edit a recurring entry as a... recurring entry, meaning you've got to do right the first time and cannot change the duration or anything for all workouts. That's a good start but this need to be improved to make it usable. Yup, that's by design. You can edit individual workouts later. Once created, there is no association with a "series" or anything of that nature - the workouts are simply copied repeatedly after the goal adjustment and date parameters are specified. Hiya, any news when you'll be able to add interval workouts to the planed workouts? Cheers! How would you suggest I add a planned workout that included time in different zones? Say for example, a tempo run that includes 20min of warmup/cooldown on each end, but with 20min at T pace/effort/HR in the middle? I've tried inputting a planned run of 40min at the appropriate Intensity, and a 20min at the appropriate Intensity, but it didn't recognize that I had completed the 20min when that time came. Ideally: You want to create a planned workout with intervals. 1. Create 3 separate planned workouts, then stop the watch and restart after warmup and before cooldown. *** It's going to effect your total workouts metrics, which you might not want, but your workout pace will be accurate, and you can re-categorize the warmup/cooldown separately, as a walk or recovery running or something, which is nice. 2. Create 1 planned workout, use your T pace as the goal pace, and put the warmup/cooldown in the notes. *** This is going to throw the plan/actual pace/time off, and analyzing the overall speed will be a bit more difficult, since the "workout" is now a segment within the bigger workout. There is a 3rd option which I'll call 1b, and that is only planning your actual workouts, and excluding the warmup/cooldown time from your plan. My personal approach is #1. I don't mind stopping/starting the watch, and I like to see warmup/cooldown as separate workouts. I typically categorize these as walks, and call it a day. Then in my logbook I have just the runs as runs, and it's "cleaner" for mileage and time totals. But... this is just how I do it, and others do it differently. Although I like the idea of starting/stopping the watch and wouldn't mind doing that...I think it's simpler in the long run (for both the running as well as inputting runs in ST calendar) to estimate the average effort for the workout and choose that as the "planned" intensity. So, the above workout with the T work came in around effort of 44...if I choose 60min at "04-Moderate" Intensity then that gets me pretty close to that 44 (48 actually). But yes, a structured workout planned would be even better. Thanks again! Did the work out flag color disappear? I'm trying to visually flag hard and easy days in the calendar and thus looked like the best way of doing it, but it doesn't show up for me as in the screenshot. The colored flag feature still exists. Click the check box in the upper right corner of the dialog to change the flag color. I was experimenting with this feature but was expecting that the Intensity field would be automatically calculated from the duration and pace. It doesn't appear to be... so how should I estimate intensity in advance? Any plans to integrate with TrainAsOne soon ?